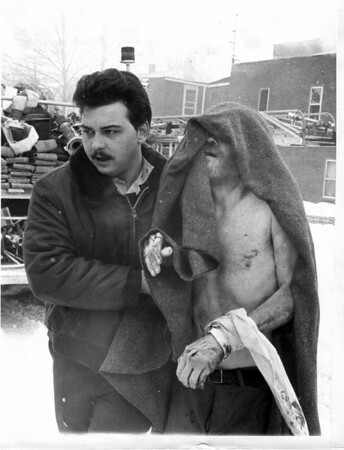 Rescued from fire - Clayton Merrifield, right is evacuated by a rescuw worker during a fire at the Hotel California in Niagara Falls. Merrifield was one of four elderly residents rescued in the blaze at the apartment building. Arson is suspected in the fire, which injured several persons, including a firefighter. Photo - By l. C. Williams - 2/1/1982.